Watering your foundation can save you Thousands in repair costs! This system eliminates the trouble of constantly resetting your watering timer - and it does a FAR better job! A MUST for all homes on expanding clay soils. 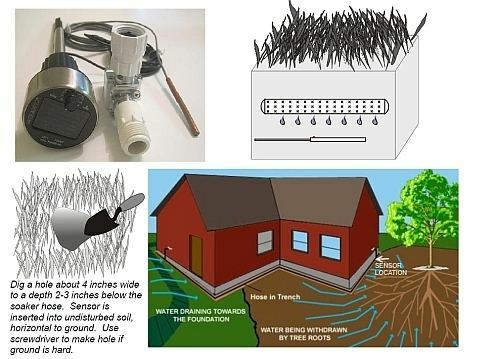 An inexpensive, very easy to use, self-contained, solar powered watering system based on auto timing and soil moisture – designed for years of use and hundreds of thousands of cycles. Watering your foundation in areas with expanding clay is highly recommended by experts. 1) Connect pre-attached stake and stainless steel tube to the control assembly [shown above] and place in the ground where the sun shines at least 5 hours a day. Turn knob to below “1” for no watering until the unit charges in the sun (up to 24 hours). 2) Place the slender sensor rod in an area watered by the system, about 2-3 inches under the soaker hose used to water your foundation. It is your choice to place the soaker hose at ground level or below. Place it about six inches from your foundation. Dig a 4 inch hole to a depth 2-3 inches below the soaker and insert the sensor – red dot up – at a horizontal to the ground into undisturbed soil. 4) The next day make a note of the number of blinks on the controller. This gives you the current soil moisture reading. If the soil moisture is about right, adjust the knob to the same number as the blinks to give good watering. If the soil is too dry, adjust the knob up a number or two, and down a number or two if already too wet. 5) Periodically check the soil around the foundation. Adjust the knob setting up or down as desired for more or less watering. Copyright 2013 WaterGreat LLC All rights reserved Product may vary slightly from the item pictured.